Day nineteen of our American tour was spent driving in a bus through Arizona country. Stripes of pink, orange and brown in the rock formations, helped relieve the monotony of the landscape. By mid- afternoon the bus started to climb and the desert scenery changed to snow. Miles and miles of it, as far as we could see. I just love snow! The sight of it turns me into a different person; snow creates in me a heightened awareness, which produces a perpetual ‘high’! My fondness for this particular element is hard to explain. My only previous association with it had been a most unsatisfactory one. 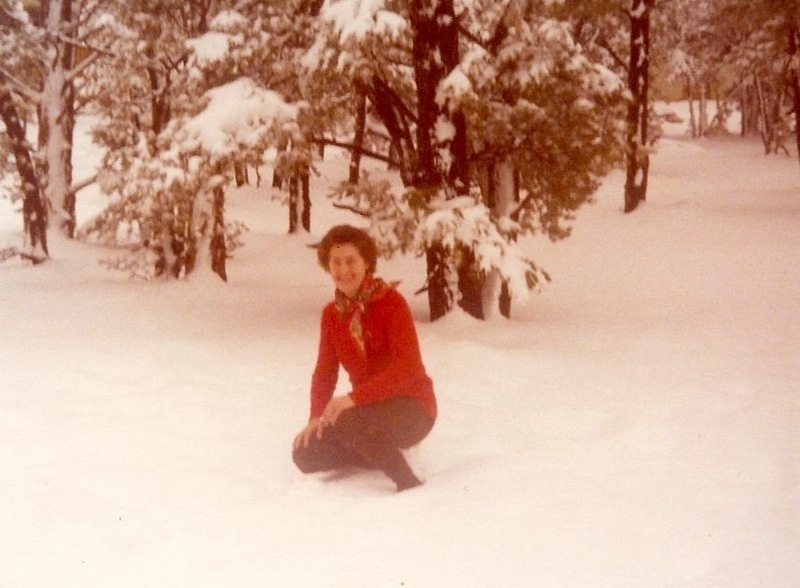 Some years before, we had accompanied the Stroud Boy Scout Group on an excursion to the snowfields. Our daughter Anne, her fiancé Robert, our son Tony, my husband Lloyd and myself made up the number needed to fill the bus. Having performed at better than average on the tennis court and golf course in my youth, I looked forward to trying my hand at skiing. “Oh well, we won’t be here long “, I said confidently, as she and Robert attached our skis. They explained the stocks were for balance and implored us to keep the tips of our skis pointing inward at all times. To show us how easy it was, they executed a couple of technically perfect runs, with knees bent slightly and tips turned in. “ Be careful Mum,” cautioned Anne. “Keep the tips turned in”, Robert reminded me. I shoved off vigorously. Bad mistake! “It is hard to remember everything the first time, but I did tell you to keep your skis together.” Robert chided as he helped me to my feet. “But I did remember”! I protested hotly. “I just couldn’t control them; the farther I went the farther apart they got”. “Never mind Mum, everyone falls down at first” said Anne, brushing me down. Giving the lie to this statement, my young son and my husband glided sedately down the minute slope. “That’s the way to do it,” I thought. “I’ll take it easy this time.” I then eased myself down the slope. Over-cautious on take-off, my back half didn’t catch up with my front half, which subjected me to the indignity of falling flat on my face! Adding to my embarrassment was the laughter of my nearest and dearest who showed no concern for any injury I might have sustained. I did not appreciate their amusement at my expense and told them so! Tony was deprived of television for a week, a savage glance in his direction indicated to Lloyd what his deprivation was to be; and Anne was informed, in front of witnesses, that she would definitely inherit my souvenir spoon collection when I expired. Anne and Robert soon pronounced Tony ”ready for the higher slopes”. My vision of yodelling down the pristine heights vanished as I watched them board a passing ski lift and disappear up the mountain. “I wish someone would take that little show-off home and put her down for her nap!” I said petulantly, as a ponytailed three year old, on six-inch skis, sped by for the hundredth time. When advising me about the higher slopes, Anne had said it was dangerous. The ‘nursery’ slopes are close to the casualty room. As we observed the feverish activity going on there we realised her warning had been a valid one. “These chaps are having a busy afternoon,” said my now attentive husband; indicating the white-coated stretcher- bearers as they sped by with yet another skiing victim. By recklessly adding, “That snow up there must be harder than it looks!” he forfeited any goodwill his solicitude had gained him. Disclosing that he had arrived at the casualty room assisted by his father and myself, a white-faced Tony was refused medical aid on the basis that he had not been propelled down the slope on a stretcher! Glancing at the poor unfortunates who had been, and seeing the nature of their injuries, we were thankful that he didn’t fit into that category. Their broken limbs, injured backs and bandaged heads made his painful knee seem very minor, by comparison! The memory of our romantic reconciliation in the darkened bus, on our way home to Stroud that night, made me smile. “What are you grinning at? “Asked the person sitting next to me when we finally arrived at the snow- covered Grand Canyon.